The first part of a planned three-volume work devoted to mapping the transnational history of Australian film studies, Australian Film Theory and Criticism, Volume 1 provides an overview of the period between 1975 and 1990, during which the discipline first became established in the academy. Tracing critical positions, personnel, and institutions across this formative period, Noel King, Constantine Verevis, and Deane Williams examine a multitude of books and journal articles published in Australia and distributed internationally though such processes as publication in overseas journals, translation, and reprinting. At the same time, they offer important insights about the origins of Australian film theory and its relationship to such related disciplines as English, and cultural studies. 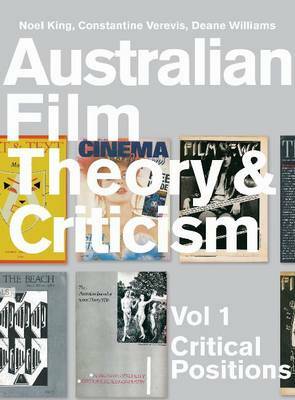 Ultimately, Australian Film Theory and Criticism, Volume 1 delineates the historical implicationsÂ—and reveals the future possibilitiesÂ—of establishing new directions of inquiry for film studies in Australia and internationally.